There can be few operations more critical than the ambulance service – maximising the availability of ambulances and crews is vital. 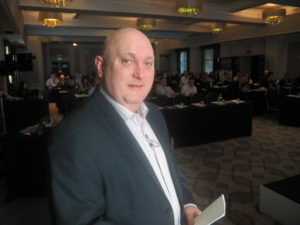 London Ambulance achievement in boosting availability was explained by Justin Wand, deputy director – fleet and logistics in the opening session of the Supply Chain Conference in London this morning. Justin Wand at the Supply Chain Conference. Wand said that 99 per cent of ambulances that go through the process are now prepped to standard. He also highlighted the increased responsiveness of the system, and the ability to medications in the system. This organisation had tried to do this several times, pointed out conference chairman Richard Hunt, who is a former chairman of London Ambulance service. He highlighted the role of Justin Wand, who has a clinical background, in driving through the changes. Rather than moving to Midlands, FatFace chose to stay close to its roots on the south coast. It built an 80,000 sq ft building, with space for another 40,000 sq ft. It has three mezzanine floors. More stock is now held in the warehouse rather than the store and respond more flexibly to get the right product to the right place. The Supply Chain Conference is taking place at the Grand Connaught Rooms in central London today and tomorrow.